Re: Circles, lots of circles what for are they? It's not an old drill gauge..or mm drill bit gauge? for weighing out your gold nuggets! realityguy wrote: It's not an old drill gauge..or mm drill bit gauge? The clangy things for different sized bells? 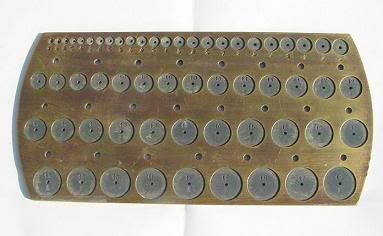 These are for punching holes of very precise diameter? 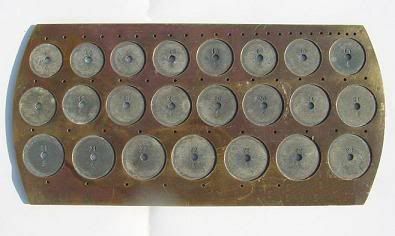 ConnieD wrote: These are for punching holes of very precise diameter? The only other thing is some kind of machinist's hole gauges..slip them in a hole to see how big a drill bit/ream/hole making tool you need to make a hole that size.It appears they have a shoulder on them to prevent them from falling in..
Are you sure they are not some machinist homemade set of tiddleywinks to pass the time on their break?